I was bumming around Santa Monica with The Marinater when he suddenly, and without provocation, turned on me. Something to the effect of "If I don't eat soon, I will turn your brain pan into an ashtray" was muttered. I found this especially disconcerting, since the SOB didn't even smoke. Fortunately, another friend had mentioned that I hadn't lived until I had tried a burger from Big Dean's Oceanfront Cafe (Big Dean's). Big Dean's was located just in front of the Santa Monica Pier. It was the sort of place that you really had to seek out, because it was tucked away enough that I would have never stumbled upon it. Big Dean's had been in existence for 110 years. The vibe and look of Big Dean's was beach bar, and rightly so. Parking was the usual Santa Monica hassle, but that was to be expected on a Friday evening. We found immediate seating in the back patio area where a crowd of locals had already established camp. We ordered a couple of Big Dean's Cheese Burgers. These were double meat and double cheese cheeseburger for $7.75. We could have opted for singles ($6.00), but the nascent threat of my skull being used as a tobacco accessory was still resonating with me. Our burgers were ready in about 10 minutes. The Beef: The twin 1/4 pound patties packed a wallop of beef flavors. It was like getting punched in the face with a beef boxing glove. While this was Chuck, it was high-quality Chuck. The fat content was only 12%. In spite of the leanness, the burgers were very juicy. There was a nice funk from some aging. This was Chuck, so it did lack the complex undertone of other cuts of beef. Still, the burgers at Big Dean's Oceanfront Cafe tasted EXACTLY the way that cheeseburgers should. The beef was a straight up winner. The Seasoning: Yep--salt and pepper on the exterior of the thin patties. The salt and pepper perfectly complemented the strong beefy flavor. 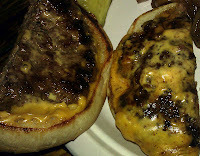 The Sear: Considering the thinness of the burger patties, the sear was really good. It was not a deep, thick monster of a sear, but it was crisp, dark, and rich. The sear added a dimension of flavor from the Maillard Reaction to the burger. This was both expected and welcomed. As expected, the thin patties were cooked to Well-Done, but this was a juicy and properly seared Well-Done. The Preparation: Everything about the preparation of the Big Dean's Cheese Burgers was as it should have been. 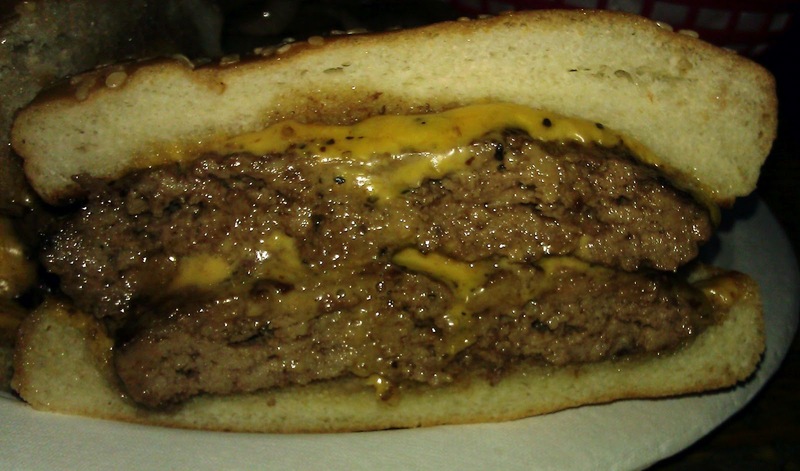 The burger patties were formed, by hand, on a daily basis from pre-ground Chuck. As we savored our tasty burgers, a small group of locals told us that Big Dean's was their regular burger fix. For some, this was the first food that they sought out after an out-of-town trip. 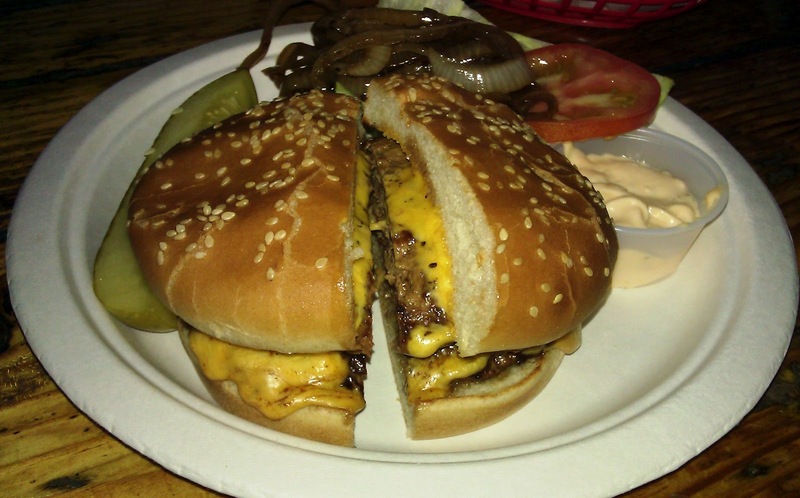 The Cheese: American cheese and two slices of it...one atop each burger patty in the double cheeseburger. American cheese has always been my "go to" cheese. In this case, it was perfectly melted. It provided the usual, reliable hits of creamy, gooey, savory, and umami. The Bun: The buns at Big Dean's were delivered three times each week by Gallaso's Bakery. These were fresh, moist, yeasty, seeded, slightly sweet, standard burger buns. 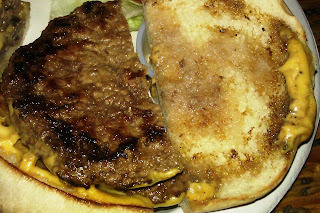 The buns were nicely toasted, and this provided a bit of satisfying crunch around the edge of the burger. The Meat To Bun Ratio: This was perfect. The bun contained the juices and molten cheese without upstaging the beef on the palate. The Toppings: The Iceberg lettuce was fresh, sweet, and crisp. The tomato slices were ripe and hearty. The Fries/Rings: The fries were just fine. Previously frozen, crinkle-cut, peel-off, and par-cooked. 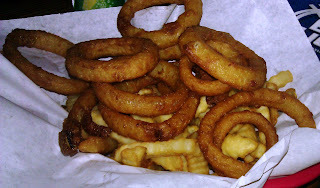 The fries and rings were properly crisped and browned in fresh, hot oil. The Value: Heck yes! $7.75 for a really, really good double cheeseburger. Big Dean's served up a burger with much better than average value. It was no wonder that Big Dean's Oceanfront Cafe had attracted and maintained such a loyal following of locals. The restaurant was located in an area that was infested with tourists. Big Dean's could have phoned in the food and still done a fine "one and done" business by over-charging tourists for sub-par chow. Instead, they served up quality burgers with pride. It was a pity that more establishments didn't follow this simple formula. From Eddy, our server, to TJ, the manager, Big Dean's staff was inviting, knowledgeable, and enthusiastic. Burger Review : All burgers should be at least as good at the cheeseburgers at Big Dean's. Basic ingredients cooked with care and pride resulted in a darn fine burger. This is great! Just yesterday some friends from Italy were asking me where we should have gone to taste some good burger and now I know it! Thanks for sharing! It's so good at Big Dean's. Also Pier Burger is pretty darn terrific, too. It is located on the Santa Monica Pier....just West of Big Dean's. You can't go wrong with either one. Roger, it would be rude not to! I hear the custard shakes at Pier Burger are the best thing on the menu.